Recently, the Manchester School District announced a new bell schedule for all high schools, middle schools, and elementary schools in the district. 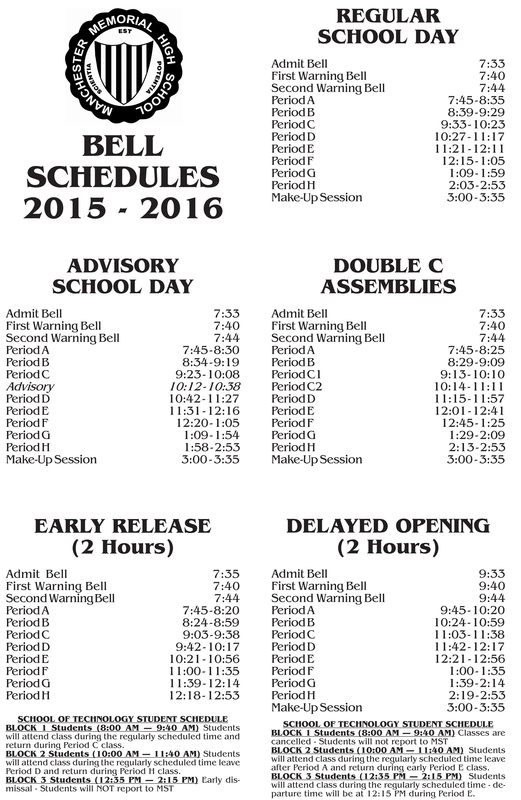 Being MMHS students, we will have a slightly lengthened school day starting on November 30, 2015. The days will be just eleven minutes longer, and that will allow for three built in snow days at the end of the year. With the new schedule’s addition of eleven more minutes to each school day, class periods will be roughly lengthened by just a minute or two which will make each day end at 2:53 pm instead of the previous dismissal time of 2:42 pm. The addition will allow the school year to have three built in snow days so that the students of the Manchester School District will be able to get out on June 9, 2015. Memorial’s advisory bell schedule will be changed as well, along with the double-C assembly bell schedule, early release bell schedule, and two hour delay bell schedule. Manchester Memorial High School students and teachers alike have long awaited these new bell schedules, but whether or not they are effective, or even worth it, stand to be tested. Two years ago, this schedule was implemented, allowing Manchester Memorial High School to miss five snow days without having to make them up. This 175 day schedule was a big hit with students, but this year we only have three built in snow days unlike the previous five built in snow days from the schedule two years ago. This is due to not starting the new schedule until November 30, having already had approximately three months of school in session. The reason why this schedule was not implemented last year was due to the lack of a contract for the MSD teachers, but this year they scored a contract just barely before the school year started and we are now planning to start the schedule by the end of November. With so much controversy from students and teachers, the new bell schedule will definitely have it’s ups and it’s downs, but it is still a couple months away from being implemented, but do not fret, the new schedule will soon become routine.